Is This Ariana Grande’s Engagement Ring or Is This Whole Thing One Big Sham? When most people look at the hulking piece of jewelry on the ring finger of Ariana Grande’s left hand in the photo above, they see confirmation that she and SNL actor Pete Davidson are engaged to be married—that theirs is a whirlwind romance that should remind all of us in these dark days that deep, suffocating love still exists in this world. 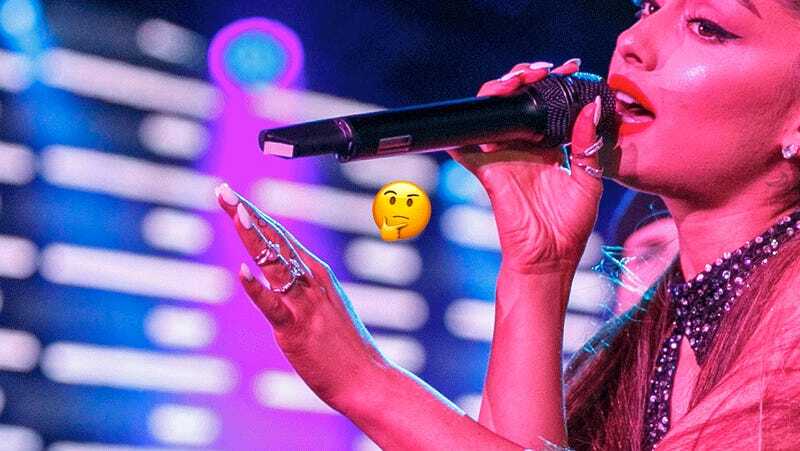 But when I look at the hulking piece of jewelry on the ring finger of Ariana Grande’s left hand in the photo above, I see questions. I see uncertainty. I see deception. I am a firm believer that no rumors surrounding a celebrity’s engagement should be taken seriously until the celebrity has announced the agreement on at least one (1) social media channel, or—if they’re old school—confirmed the news directly (not through an anonymous source) to Us Weekly or TMZ. And once that happens, no wedding rumors should be taken seriously until there is A) an image of the wedding on Instagram, and B) (because famous people sometimes lie about this) other celebrities—also known as witnesses—in accompanying photos. Until this happens, I don’t believe you, Ariana. I know you and Pete are young and attractive and rich and famous and impulsive, and I know there are no rules when it comes to the required duration of one’s courtship before deciding to spend an entire life together, but I also know you have an album coming out soon—and that it drops around the time Pete’s show returns for another season! And I also know you have long-standing problems with celebrity journalism and wouldn’t mind pulling a fast one on the industry. Even tweets like this make me question the legitimacy of this whole thing. Despite what the headlines are saying, that tweet confirms nothing. So, I’m calling your bluff, I’m calling your bluff, I’m thinking I’m doubting I’m calling your bluff.